Las Cruces in Southern New Mexico offers plenty of activities and entertainment year-round. A great place to camp while visiting the area is Hacienda RV Resort. Featuring 113 sites and full hook ups, Hacienda RV Resort is one of the best in the state. This pet-friendly, five-star resort has plenty of amenities. Some of the highlights include free cable TV and free Wi-Fi. The southwestern-style clubhouse offers 24-hour access to the private showers, dressing rooms with hair dryers, and a spotless laundry facility. You can relax in a large hot tub on their outdoor patio, or workout in their exercise room. The clubhouse also offers a large events room for playing cards, building puzzles, or other gatherings. Within walking distance of the resort is Old Mesilla, where the Gadsden Purchase was signed in 1854 making New Mexico a part of the United States. This quaint little community features a museum along with the Basilica of San Albino, which was originally built of adobe in 1855. The church was rebuilt to its present structure in 1906. 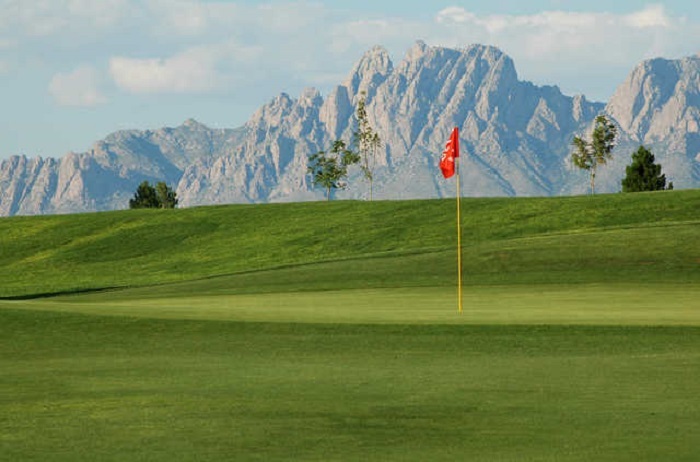 Golfing is also enjoyed year-round in Las Cruces, which sits at an elevation of 3,900 feet. The immaculate New Mexico State University Golf Course opened in 1962 and is located on the beautiful campus of New Mexico State University in Las Cruces. This 18-hole, par 72 championship course stretches to 7,204 yards and is open to the public throughout the year. New Mexico also claims to be the oldest wine producing state in the country, with production starting in 1629. For the wine enthusiast, there are more than 47 vineyards and wineries located throughout the state. The closest wineries to the Las Cruces area include Rio Grande Vineyard and Winery and La Vina Winery, the oldest winery in the state. 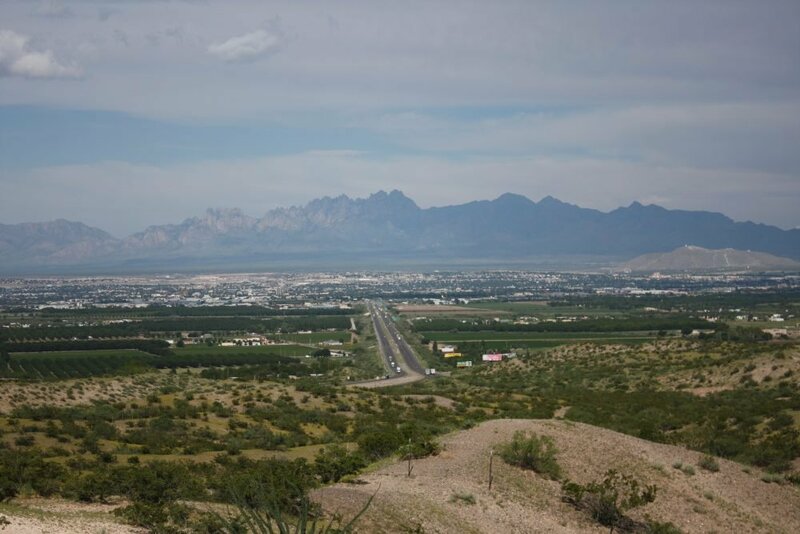 With a population of roughly 100,000, Las Cruces sits on the edge of the Chihuahuan Desert, at the foot of the Organ Mountains adjacent the Rio Grande. Las Cruces is 225 miles south of Albuquerque, 275 miles east of Tucson, Arizona, and 40 miles west of El Paso, Texas. The city enjoys 350 days of sunshine a year. For more information, see their website Visit Las Cruces. You can also read more about Hacienda RV Resort on Campground Reviews. We have snowbirded for varying lengths of time, up to a month, in Las Cruces for the past 6 winters. But we have always stayed at Sunny Acres RV Park on North Valley Drive, a block south of US 70. In fact, we were just there last month. Within a block of this completely tree-shaded, older RV park, you can walk to a grocery store, a dollar store, an auto parts store, and a Tractor Supply for tools and hardware. A self-service, coin-op car-truck wash is across Valley and two propane dealers are around the corner on US 70. The park has a club room, inexpensive coin-op (no plastic card rip-off) 24-hour laundry, off-leash dog yard, and RV storage. And the locked (keypad) restrooms have four private, individual rooms with a toilet, shower, sink, mirror, and electrical outlet in each. What more could you want in a long-term RV park?